The US case for extraditing the three NatWest defendants in connection with the Enron scandal rests on the allegation that their alleged fraud against NatWest was hatched and perpetrated not only in the UK, but in the US as well. 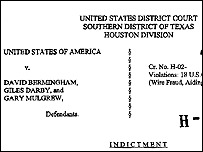 The indictment handed down by a Texas Grand Jury in September 2002 says David Bermingham, Giles Darby and Gary Mulgrew worked with two US-based former Enron executives to commit the fraud. It also claims their communications put the case squarely under US jurisdiction. The grand jury alleges the trio "devised and executed a scheme to defraud NatWest and GNW (Greenwich NatWest) and deprive them of money and their right to honest services". 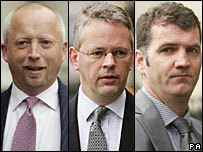 The three bankers have denied any wrongdoing. The indictment says they persuaded GNW to sell its stake in an Enron subsidiary, named Swap Sub, for $1m - despite knowing it was worth much more. The three ended up paying just $251,993 for a stake in Swap Sub on which they later made a profit of $7.3m, the indictment claims. Their profit, it alleges, came from Enron's coffers as part of a deception practised by Enron's ex-finance chiefs, Andrew Fastow and Michael Kopper - both of whom have pleaded guilty to fraud charges in connection with the Enron scandal. According to the indictment, Swap Sub - based in the Cayman Islands - was created by Fastow and Kopper in 1999. Its purpose was to help Enron protect itself from potential falls in the share price of an internet company in which it held a sizable stake. A Caymans-based subsidiary of GNW, Campsie, was an investor in Swap Sub. The indictment also suggests that the three defendants conspired with Fastow and Kopper to "restructure Swap Sub for their own benefit". To do so, it says, the three persuaded GNW to sell its Swap Sub stake for $1m to a company controlled by Kopper. It goes on to allege that Kopper created several layers of ownership - partly to "conceal the true structure of the Swap Sub transaction" - and agreed to sell a stake in one of the companies concerned to the three defendants. In March 2000, Fastow got Enron to agree to pay Swap Sub $30m as part of a deal to get the internet firm's shares off its books. Of that, Fastow allegedly told Enron that $20m would go to GNW. But instead, Kopper-controlled firms had already bought GNW's stake in Swap Sub for just $1m, the indictment claims. In April, the three defendants wired Kopper $251,993 for their stake in a firm called Southampton K Co.
That payment, the indictment says, gave them a half-share of GNW's Swap Sub stake "that Enron was prepared to purchase for millions of dollars". The indictment goes on to say that the trio's profits then arrived in May - a wire transfer for $7,352,626 paid into an account supposedly controlled by David Bermingham at a Cayman bank. The rest of the $20m Enron thought it was paying GNW - on Fastow's recommendation - is alleged to have gone to Fastow, Kopper "and others". It is the two wire transfers - together with three faxes and two emails between GNW (and its subsidiary Campsie) and Enron - which are at the heart of the US's case for extradition. The US says the "scheme and artifice to defraud" GNW and NatWest was carried "by means of wire communication in interstate and foreign commerce writings, signs, signals, pictures and sounds". That, the Grand Jury indictment says, makes it wire fraud: a Federal offence.